This was my first New Years abroad. I’ve always wondered what it would be like celebrating a new year hours ahead of my family and friends in the States, and I can tell you – it feels pretty much the same, because someone somewhere is always hours ahead. So, there’s that. But last night’s celebration in Vienna felt nothing close to the same as previous stateside celebrations. In my opinion, there was a bit more magic, more excitement, and more interesting traditions – some of which surprised me. In the U.S., we wish each other “Happy New Year”. In Austria, we wish one another “einen guten Rutsch ins neue Jahr”. A “Rutsch” is a slide, so basically the Austrians are wishing each other “Have a good slide into the New Year”. I will never fall out of love with this phrase. How was your slide into 2014? A safe and graceful landing, I hope? Unless I’m forgetting something, the only time I’ve ever seen the famous 4 Leaf Clover on shirts and hats and figurines is on St. Patrick’s Day. But on New Years in Austria, the 4 Leaf Clover makes its debut in a big way. It is on absolutely everything. And traditionally, if you’re spending New Years in Austria, you are to purchase something with a 4 Leaf Clover on it, and give that purchase to whomever you’re spending New Years with as a good luck charm for the year. Last night, we gave our friend a lucky mushroom, because he’s really into mushrooms (for making tasty sauces reasons), and to his brother, we gave a teeny-tiny pig. I need to do some research on how and why Austria chose its lucky charms, or maybe someone can tell me, but for some reason a pig is like, the charm of the New Year. My husband and I were downtown last night to get an early, chaos-avoiding glimpse of what goes on celebration wise, and I have never seen so many pigs in my life. Not real pigs of course. But pig hats with four dangling legs? You betcha. We should probably all own one. Our German teacher told us a long time ago that at the stroke of midnight, Austrians everywhere turn on “The Blue Danube Waltz” and naturally, waltz. We very much wanted this to be true. Not that I’m calling our German teacher a liar, I just mean, we really wanted to see this culture-wide tradition happen before our own eyes. And we did! It wasn’t as “drop everything and waltz” as we had imagined, but the people in our firework watching/shooting area did indeed waltz to the music on their phones or in their cars. Will and I tried to waltz alongside a couple of older couples who really knew what they were doing. Our attempt was embarrassingly adorable. Sorry we didn’t take video. I always thought the U.S. was intensely firework crazy what with its gigantic firework stores and tents, but now I think it might be Austria who’s firework crazy. Our Austrian friend told us that, on average, an Austrian family will spend about 200 euro on fireworks. That’s quite a bit of mula for fireworks. It definitely pays off though – big time. We heard fireworks days before New Years, and the fireworks lasted well into the late hours of the night (or the early hours of the morning?). We heard them from every direction and the sky flashed with all sorts of colors. I hope and pray we never experience war in our lives, but if I were to imagine what it sounded like in real life, last night would be it. We’d never heard or saw anything like it. Happy New Years and einen guten Rutsch ins neue Jahr! Hi Holly! What many Austrians don’t know either: “Einen guten Rutsch!” comes from the Jewish “Rosch ha schana tov” (“einen guten Rosch”) – at least this is one of the more accepted theories. I prefer Heb 12:12-13 to “a good slide”. That is definitely an interesting tidbit. Thanks for sharing! This is amazing. 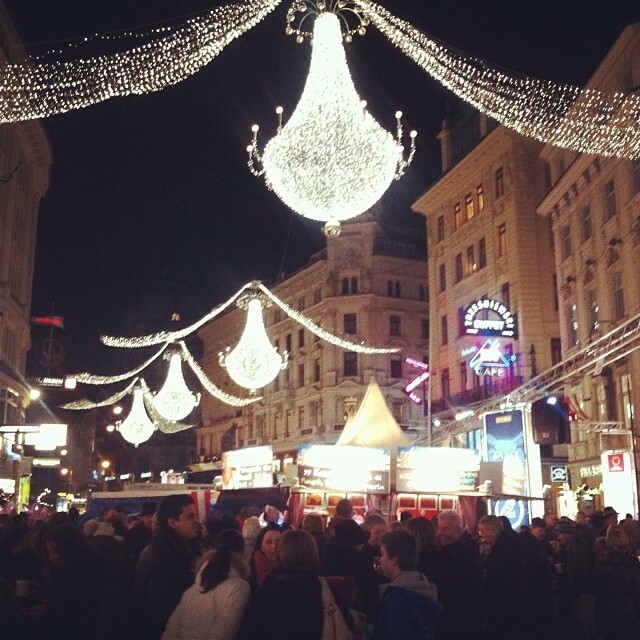 I have family in Vienna and was lucky enough to spend New Years there this year, too. I completely agree with the pig thing! Total pig overload! Also the fireworks were insane!!! By the end of my trip I was honestly getting quite annoyed by the constant barrage of fireworks occurring even in the middle of the day and for days afterwards! My cousin told me that the city of Vienna alone spends something like 30 million euro on fireworks each year! But I guess it’s good to remember that they do not celebrate the 4th of July or any other firework-y holiday like in the states so they really go all out when they can, I guess. If you have family here does that mean you’re part Austrian? “Pig overload”. Love it. A small piece of me wants to own a pig hat just so I can say I have one, but the majority of me would be embarrassed to have such a thing sitting in my closet, so I’m sticking with the tiny pig charms instead. The fireworks are impressive, but I agree, it could be kept to maybe just that one night instead of in the middle of the day two days prior and two days after. But hey, they love their fireworks.